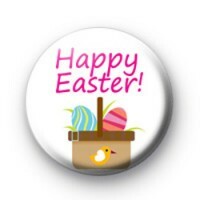 White Happy Easter 25mm Button Badge. This is a fun Easter greeting badge, it has the slogan Happy Easter written in pink lettering and a basket of Easter Eggs underneath. Very fun and perfect to use at any Easter Party, Easter Egg Hunt or simply to spread a little Easter love. Our handmade badges make lovely alternative Easter Gift ideas and we have hundreds of great designs. Everything from Easter Bunnies to Sweet Yellow Easter Chick Badges and even lots of fun Easter slogan badges too. All our badges are proudly handmade in the UK by us.